2008 Ford Mustang SHELBY 2008 FORD MUSTANG SHELBY!!! If you are looking to buy an antique or vintage car, or you need parts for a car you're restoring, you've come to the right place. This site is updated continuously with the listings of antique and classic cars for sale on eBay -- and often you can snap up a bargain! 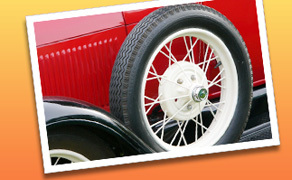 To your left you'll find links to listings of complete antique cars. Some of them are restored to like-new condition, while others are project cars waiting for someone like you to come along and restore them to their original beauty and elegance. To your right are links to all the parts you might need for your restoration project. Whether you need a bumper for a 1957 Plymouth Fury or a spare tire for a 1930s Packard, your best opportunity to find the exact vintage car part you need is right here. 1964 Fury -- 1964 Plymouth Sport Fury, unrestored one owner car! 1995 Jaguar XJ12 Sedan Fully Serviced Southern X305 54K mi Loaded CARFAX 1995 Jaguar XJ12 Sedan Fully Serviced Southern X305 54K mi Video CARFAX! 1996 Ford Explorer Priced to Sell XLT v8 1996 Ford Explorer 5.0L V8 2wd Similiar Lots of torque and drives great!!! Fun!! 1950 Chevrolet CoE 1950 Chevy COE hot street rod flat bed truck mid engine trade for Tesla or…. 1969 Firebird -- 1969 PONTIAC FIREBIRD RAM AIR III FULLY RESTORED, ULTRA RARE, THE BEST!"